Instead of sipping a gin and tonic, why not down it as a powder, a custard or a gel? At a Grant Achatz lecture, followed by dinner and a 50-foot-long dessert that could have doubled as a Slip 'N Slide, the Chicago chef revealed some of his techniques for creating the edible cocktails he plans to debut at his upcoming bar, named Boom or maybe Aviary. The bar will open in somewhere in Chicago, supposedly by the end of 2010 in 2011. The "bartender" at the new venue isn't some up-and-coming mixologist; he's Craig Schoettler, the chef de tournant at Alinea. Schoettler and Achatz have been busy refining the alchemy of manipulating alcohol into food, with a few edible pre-prohibition cocktails already on Alinea's menu for the past year. 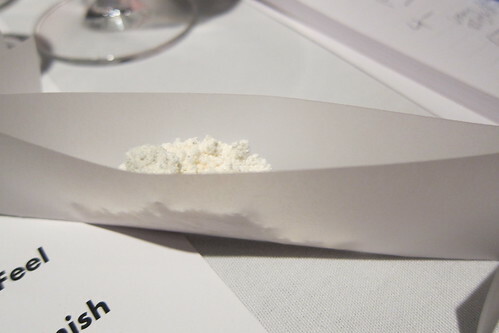 Melding Achatz's mastery of molecular gastronomy and his ringmaster's flair for the dramatic, Craig demonstrated how to combine tapioca maltodextrin, baking soda, powdered sugar, citric acid, quinine, a tincture of a neutral grain spirit and juniper berries to make a powdered gin and tonic. The "drink" arrives in a packet that you rip open, like an adult Pixie stick. The flavor was intense and not entirely pleasing. Imagine gulping down in one swallow an entire drink that you would normally sip over the course of 20 minutes. Later, at dinner, we tried three more of these edible cocktails, each of them a potent 1-inch square of flavor. The transmogrification of liquid into solid intensifies each drink's sharp alcoholic note in a way that can be disturbing. The second of these edible cocktails, a chewy gel cube made with Laird's Apple Brandy, grenadine and thyme tasted like a hot toddy, while the final cocktail, made with Cynar, Carpano Antica and Flor de Cana, was an amazing simulacrum of crème brûlée. 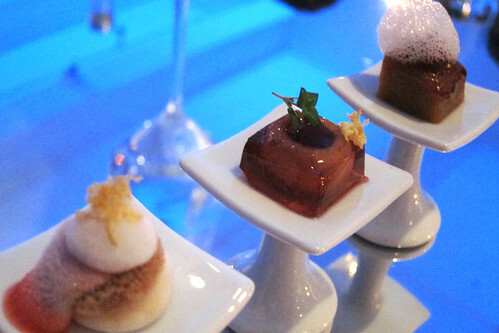 Whatever else Achatz may be, boring he is not.